Children of Fire�s volunteers and staff regularly take toys to burned children in hospital and to other children if they share the same ward as those who are burned. In October 2012 our visits included a trip to the Steve Biko Pretoria Academic Hospital and to the Tembisa Hospital. At the Pretoria hospital, unusually there were no burned children in the ward, though sadly a 28 year old man had died the night before in the adult-burns-ward from 98 per cent burns sustained in a shack fire. Still our brave little Seiso R (aged 7), who was himself originally burned in the greater Pretoria area, took gifts to give out to some 30 children, accompanied by a new member of our team Anne Maclachlan. Children in that ward had conditions like hydrocephalus (water on the brain) or had been injured in motor vehicle accidents. The nursing staff, parents and patients were happy about the visit. A week or so later we went to Tembisa Hospital where there were 17 badly burned adults, 10 burned children and six other children injured through different causes. They were given beautiful toys and individual wash packs by new volunteer Natasia Kruger and burns survivor Tshepiso Ntoyi (20). The children there had mostly been burned with hot liquids. Thabo 6m was burned with hot water, Lehlona 7m was burned by a kettle, Vuyo 1y was burned with hot water, Lethabo 2y7m fell into hot water, Julia 2y3m pulled a hot pot from the stove, Marcus 2y6m was burned with a hot kettle, Jiwane 6y was burned with a homemade hot floor-polish (made from candle wax and paraffin), Ivan 7y was burned by a falling pot, and Amony 7y pictured here had 20 per cent total body surface area flame burns from a shack fire. Thanks to all who give us gifts that we can take to people in hospital. 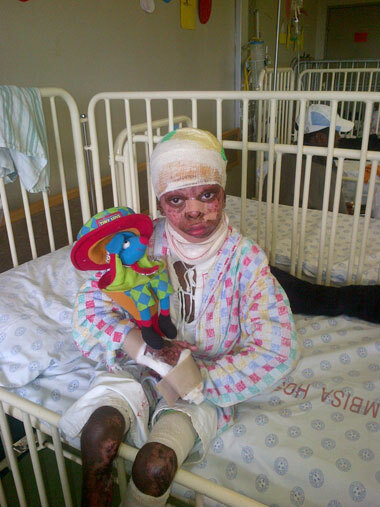 The adult burns survivors like toys as much as the children do, and all appreciate wash packs because hospitals do not provide toothpaste, toothbrushes, face cloths and lotion. Even bars of soap are not always easy to come by.